In the last month the Aqua-tnet Education Gate – our one-stop-shop for education in our area – has been actively updated by AquaTT. We now have a total of 443 courses listed on the Education Gate, including 180 MSc courses, 126 MSc Programmes, 84 Other Courses and Training and 53 PhD courses. Shortly we will be approaching all partners to check and confirm their details in relation to both their institution and course information. The success of the Education Gate is dependent on the continued support from all Aqua-tnet partners in ensuring the information displayed is as up-to-date and comprehensive as possible. Through actively contributing to the Education Gate, partners broaden the scope of their online presence and engage with a pan-European target audience, who are interested in the educational options and mobility opportunities available throughout Europe in the field of aquaculture, fisheries and aquatic resources management. Contributing to the Education Gate not only advertises to prospective students but can also open opportunities for creating new connections between partners. Please CLICK HERE to download a pdf document outlining how to log in to the admin part of the website and add, delete and edit information regarding yourself, your institution and your MSc, PhD and mobility courses. You can contact Marieke Reuver at marieke@aquatt.ie for more information. Don't forget to share links to any Internet resources that might be interesting and useful for aquaculture and fisheries learning and teaching via the Aqua-tnet Diigo group. If you are not already registered you will need to sign-up for a free account. You can then make use of the service to create your own class resource lists or to save annotations on the web sites you visit. Marieke Reuver from Aqua-tnet partner AquaTT attended the 2nd Overall Meeting of the ISEKI_Food 4 project, which was held in Kaunas, Lithuania, from 15-17 May 2013. She presented on Aqua-tnet, outlining our activities and results so far. The meeting was organised in collaboration with Rimantas Venskutonis and his team of the Department of Food Technology of the Kaunas University of Technology. It was an important event for the project, providing an update for more than 90 participants on the current and upcoming activities of the various work packages and providing a series of very interesting team working experiences, including a workshop on Knowledge and Technology Transfer in the Food Area with invited experts. ISEKI_Food 4 is an academic network similar to Aqua-tnet, which aims to innovate the education and training of Food Science and Technology (FS&T) students. Much like Aqua-tnet they focus on trying to implement soft and personal skills to produce the FS&T professionals of the future; to implement the role of the third level of education (PhD, in particular) in promoting the employability and entrepreneurship of the graduated FS&T and Food professional; and to create a framework offering lecturing qualifications for university teaching staff. The network includes a total of 89 partners: 86 partners from 27 European eligible countries and three partners from non-European countries. European Aquaculture Society Student Group (EAS-SG) has recently extended its activities to bring aquaculture and fisheries students in Balkan countries together. EAS-SG was introduced through a short presentation at the beginning of the summer semester in the Institute of Aquaculture and Fisheries at the University of Sarajevo, Bosnia and Herzegovnia. The presentation outlined the mission and objectives of EAS-SG and how to contact and join them. The presentation was attended by master's and bachelor degree students. An EAS-SG Balkan Facebook group has been established with the aim of gathering other aquaculture students in Balkan countries. Since the introduction to students in Sarajevo, students from the University of Dubrovnik, Croatia, have also started to join. The Facebook group will be used by students to exchange information related to aquaculture, internship and training offers and research with other members. As many of the posts are in English, the Facebook group is also providing students with an opportunity to expand their English vocabulary and learn aquaculture terms. Students have commented that the group is helping them to learn about new technologies in production and keep up with the latest trends in aquaculture. The next step in activities for the Balkan EAS-SG is connecting with fisheries in Bosnia and Herzegovina to find internships and training and volunteering opportunities for students. EAS-SG Balkan hopes to become a valuable resource for aquaculture students at universities in Balkan countries. If you are a graduate and would like to post your request for an internship, or your company is seeking interns, please visit http://www.aquatnet.com/index.php/167/internships/. The European Commission has provided an indicative roadmap on "Opening up Education - a proposal for an European initiative to enhance education and skills development through new technologies". It provides a comprehensive insight into EC policy development in this field. The roadmap is available HERE. This special issue of eLearning Papers brings together in-depth research and examples from the field to generate debate within this emerging research area and shed light on the way MOOCs affect education institutions and learners. To view this issue of eLearning Papers, click HERE. The Faculty of Fisheries and Protection of Waters, the University of South Bohemia in Ceske Budejovice (FFPW USB), Czech Republic, has organised a workshop entitled, Diversification in Inland Finfish Aquaculture II, which will be held in Vodnany, Czech Republic, from 24-26 September 2013 to mark the opening of the Faculty's newly reconstructed premises. Two of these facilities (hatchery and recirculation units with ponds) are part of the infrastructures which have been offered for Transnational Access as part of the AQUAEXCEL project. More detailed information about the workshop and the celebratory opening can be found on the FFPW USB website. The STAGES (Science and Technology Advancing Governance on Good Environmental Status) project has released a five minute video which provides an introduction to key concepts and policies relating to the project. The second newsletter of the MaCuMBA project is now available to download HERE or from the project’s website: www.macumbaproject.eu. MaCuMBA is a four-year EC Seventh Framework Programme (FP7)-funded project which aims to study unidentified marine microorganisms. 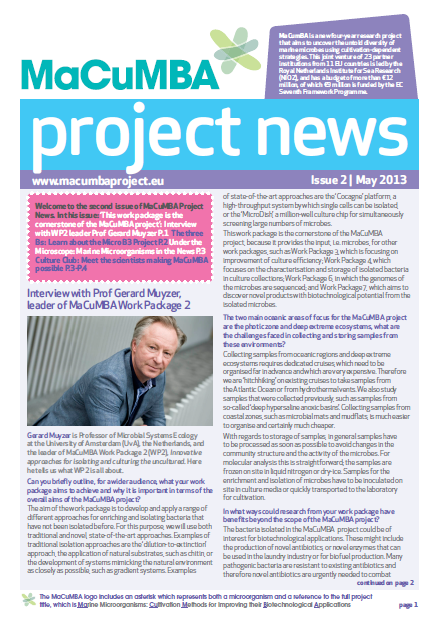 This issue of MaCuMBA Project News features an interview about Work Package 2 (WP2), Innovative approaches for isolating and culturing the uncultured, with its coordinator, Prof Gerard Muyzer of the University of Amsterdam (UvA), the Netherlands. The first in the Petri Dish Profiles series of reports on other European projects related to the study of marine microorganisms introduces Micro B3 (Microbial Biodiversity, Bioinformatics, Biotechnology), an FP7-funded project that aims to provide researchers with new analytical approaches to marine ecological genomics. The Under the Microscope section provides an in-brief look at some stories relating to marine microorganisms which have been making the news, and in Culture Club we meet some of the scientists from all over Europe working together to achieve the MaCuMBA project’s aims. The SOCIOEC project, an FP7 funded project dealing with Socio Economic effects of management measures of the future CFP, organised a special session at the 21st European Association of Fisheries Economists (EAFE) conference, held in Edinburgh from 15-17 April 2013. Six speakers presented the current status of the SOCIOEC project and its main results, methodologies and objectives. The session was entitled, SOCIOEC: Socio-economic Assessment of Management Measures on the New Common Fisheries Policy (CFP) - First Results and Upcoming Research. Leyre Goti, SOCIOEC project officer, said: “This is the only EAFE conference that will take place during the lifetime of the project, as EAFE holds conferences and workshops in alternate years. The conference is more open to a broad range of stakeholders than the workshops, and we have had the chance to involve not only scientists and industry and management representatives, but also EC representatives, NGOs and consultancy firms." EAFE is an independent association of economists working in fisheries, including catching, aquaculture and on-shore sectors in Europe. SOCIOEC aims to develop management measures that will enable stakeholders to agree and comply with new and existing legislations. 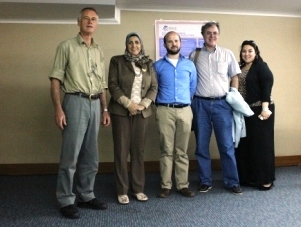 FORCE was highlighted by the AQUAMED group as being an important case-study in the Mediterranean region with regard to improving transparency in aquaculture legislation for a specific country, Egypt, and strengthening networks of a non-EU country with Mediterranean and European researchers in the aquaculture sector. Representatives from FORCE were also in attendance at a second meeting of the AQUAMED Multi-Stakeholder Platform for Mediterranean Aquaculture (Southern Europe and North Africa) which took place on 20-21 May at the same venue. Partners from the EU-funded project HEALTHY FUTURES met in Trieste, Italy, for a partner meeting on 29-30 April 2013. Discussions during the meeting centred on the progress of the work carried out to date as well as its future plans. The project, which began in January 2011, is now past its halfway point and has reached a critical juncture, with important decisions made during the meeting. HEALTHY FUTURES aims to address the risk of outbreaks and transmission of three water-related vector-borne diseases (VBDs) in eastern Africa. The project is now made up of 16 partners with the recent addition of the National University of Singapore. More than 50 stakeholders from industry, government, NGO and research sectors from 13 Mediterranean countries (Algeria, Croatia, Cyprus, Egypt, France, Greece, Israel, Italy, Lebanon, Morocco, Spain, Tunisia, Turkey), along with 20 members and observers from the AQUAMED project, met in Istanbul on 20-21 May 2013 for the 2nd Open Multi-Stakeholder Meeting for Mediterranean Aquaculture. The meeting was designed as a facilitated and interactive event. The stakeholders were asked to contribute to designing the Plan of Action for Mediterranean aquaculture, based on the constraints for the sector identified within the project, and to identify possible resources to sustain the operation of the platform after the end of the project. AQUAMED has identified research priorities in the Mediterranean aquaculture sector and set up a Mediterranean Stakeholders Platform (MSHP). The Meeting report is currently being written up and will be available on the project website in June 2013. Students! If you have submitted a poster for the European Aquaculture Society’s (EAS’s) 2013 International Conference, you could be in with a chance to win the coveted Lindsay Laird Award for Innovation in Aquaculture! At the time of her early death from cancer in 2001, Lindsay Laird was a Senior Teaching Fellow in the Zoology Department at Aberdeen University. From the beginning of her career, Lindsay worked with the expanding Scottish aquaculture industry on different aspects of salmon farming. In 1998, she became the first Chairman of the Organic Fish Producers’ association. She served as Vice-Chairman of the Scottish Fisheries Executive Committee and on the Board of Directors of the European Aquaculture Society from 1994 to 2000, when she was obliged to retire for health reasons. Lindsay also carried out research and gave lectures in countries such as Malaysia, Taiwan, Singapore, Philippines, and Borneo, where a new species of moth (Dasychera lairdi) was named after her. The award consists of a certificate and an award in the form of the new iPad2 worth €500 and a selection of new publications in aquatic science. The winner will join five previous winners from Germany, Spain, Portugal and the Czech Republic. Click HERE to learn more about the Lindsay Laird award and previous winners. The 2013 EAS International Conference will take place in Trondheim, Norway, on 9-12 August 2013. The deadline for abstract submission for the 4th YOUMARES conference, to be held on 11-13 September 2013 in Oldenburg, Germany, has been extended until 30 June 2013. YOUMARES is an international conference for young marine researchers and engineers organised by the study group of the German Society for Marine Research (DGM). To boost the development of EU aquaculture, the European Commission has issued strategic guidelines, thereby cooperating with Member States and stakeholders in overcoming the challenges facing the sector. The EU aquaculture sector has a significant growth potential and can help to spare overexploited sea resources. The Guidelines presented on 29 April 2013 will help coordinate efforts across all Member States. They do not create new legal obligations, but present a series of voluntary steps that Member States, the Commission, and stakeholders can take to promote an industry that is economically, socially and environmentally sustainable and provides consumers with healthy, high-quality seafood. Read more HERE. The new strategic guidelines are available HERE. The EAS Student Group will offer three travel grants, one worth €500 and two worth €200, to support expenses for attending EAS 2013. This year, the winner of the travel grant for €500 will also give an oral presentation during the EAS-SG workshop at the conference, which is dedicated to aquaculture students. The suggested topic for this presentation is Aquaculture in My Country - Opportunities and Future Perspectives. Please note that the oral presentation should be broad enough to fit the interest of the target audience of aquaculture students. The closing date for applications is 15 June 2013. Criteria for application and other further details can be found HERE. The organising committee of the conference is also in search of students who want to help during the conference. Students who want to help are paid with €7.5 per hour. Activities include bag stuffing on 8 August 2013, assisting in the conference rooms, taking pictures etc. If you are planning to go to the conference and want to help, please register at the lowest registration fee, which is €175, and send an email to alexandra.neyts@ntnu.no for more information. The Ibrahim Okumus Award honours the life of Professor Ibrahim Okumus (1960-2008) of the Faculty of Fisheries in Rize University, Turkey, and is awarded by the EAS Student Group. Ibrahim was one of the scientific pioneers of Turkish aquaculture and worked tirelessly to promote its sustainable development. In recognition of his achievements, the EAS Student Group will awards the BEST STUDENT POSTER CONTRIBUTION at AE2013 in Trondheim with a certificate and prize money of €300. This year's award will be kindly provided by EGEMAR Co HATCHERIES, Turkey (www.egemar.net). Fisheries and Aquaculture in Europe is a magazine published by the Directorate-General for Maritime Affairs and Fisheries. It is distributed free on request, five times a year in all the official languages of the European Union (20 since issue no. 25, 23 since issue no. 33). The online version is available HERE. AquaTT's Training News is a free monthly e-newsletter featuring the latest announcements, news, and opportunities for collaboration from the European education community. The e-newsletter also has a section dedicated to young scientists. Training News is an important dissemination channel for education and training opportunities for aquaculture and related sectors. CLICK HERE for the latest edition. PiscesTT Jobs is a free online recruitment service used by over 300 companies globally in Aquaculture, Fisheries and Marine Science. If you are interested in viewing or posting a vacancy please go to http://www.piscesttjobs.com/ or contact aquatt@aquatt.ie Subscribe at http://www.piscesttjobs.com/feeds/ for live RSS updates.